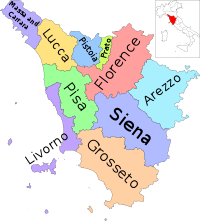 The Province o Grosseto (Italian: Provincia di Grosseto) is a province in the Tuscany region o Italy. Its caipital is the ceety o Grosseto. The Natural Pairk o Maremma lees in the province . The CIMA Festival is a prestigious gatherin o classical muisic lovers in Monte Argentario. Cairt showin the poseetion o the province in Tuscany.